Looking for the Right Music School for your Family? Since 1994 the Academy of Music has been a leader in music education having taught thousands of students from young children though to adults. 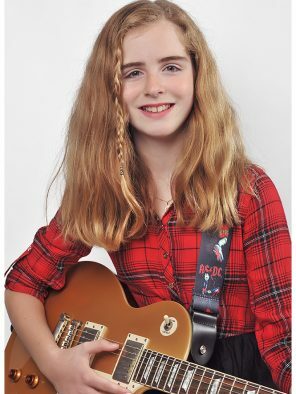 You can take private music lessons on piano, guitar, voice, violin, ukulele, and drums, at our convenient location at 400 Guelph St in Georgetown. While you’re here researching the best school for your family consider the benefits of becoming an Academy student and learn why thousands of families have chosen our school for their music lessons. You can take Private Piano Lessons, Electric and Acoustic Guitar lessons, Voice, Singing, Bass, Violin, Ukulele, and drums – All in one location! Our teachers have received their education from prestigious institutions such as York University, Western University, Humber College, Mohawk College, and the University of Toronto. Many of our instructors have gone on performance tours of Canada and the US, and have over 25 years of professional performance and teaching experience. Our music teachers are dedicated to learning about your personal musical goals and helping you to achieve them. In addition to their teaching credentials, our music teachers have warm personalities, great attitudes, and are extremely dedicated to sharing their love of music with their students. We are the only music school in Georgetown that gives their students the opportunity to earn special colour wristband bracelets (kids and teens love them! 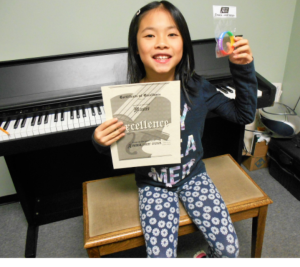 ), trophies, AND certificates for passing musical tests. Do other schools offer prizes and certificates? A few. But none of them inspire their students by giving them full colour, really cool “Musical Ladder” wristbands that they can show off to their friends. The Musical Ladder is our unique method of music education that you can only get here. More importantly when our students have a test coming up, they practice more, their parents are proud, their teachers are proud, and everybody wins. You can only get the Musical Ladder here. Learn more about the Musical Ladder System. 4. Family Safety Plan. Making sure your children are safe? Every parent is concerned about their children’s safety and well-being. The Academy of Music has invested thousands of dollars in our “4-Point Family Safety Plan” which helps parents ease their minds while their kids are at their music lessons. Our “4-Point Family Safety Plan” consists of..
Every lesson room has a video/security camera with viewing monitors in the lobby. Teaching faculty must have a current vulnerable sector police check. Office staff is on duty every day. Open Door Policy. Parents are welcome to sit in on their child’s music lesson, any time. Take a walk through our school and you’ll see children & adults of all ages experiencing the joy of music. In fact, we have many students as young as 2 and students in their 70’s learning music for the first time. Adults: It’s never too late to learn how to play an instrument. We welcome beginners and all levels, no matter what your age! 6. The most technologically advanced and fully stocked music lesson rooms in Georgetown! Our rooms are stocked with everything you need for music lessons, including amps, stereos, keyboards, pianos, monitors, and more. All you need to bring is your instrument. We have spent thousands of dollars on our studio to provide the best music lesson experience possible. Technology is also a big part of lessons at the Academy of Music and we have installed LED monitors in every classroom. The monitors have cables that can attach to iPods, iPads, or laptops. This allows students to have a modern and engaging lesson using music teaching apps, music software, Skype, and more. Feel free to “Bring Your Own Device” to your lesson in addition to your instrument! No other school in Georgetown offers this technology. One of the things that has really set up apart is our focus on providing lessons that are fresh, new, and engaging. There are so many great teaching apps out there now that we felt we had to update our teaching rooms with LED monitors. By doing so, our students have never run the risk of being bored by their lessons. It’s a challenge to engage children or adults, but by integrating technology such as teaching apps from the iTunes store, GarageBand, ProTools, you name it, we’re providing a cutting edge lesson experience in the Georgetown area. You are welcome to sit in and observe your child’s lessons at any time. If you prefer, you can wait in our spacious reception area and watch your child’s music lesson on the video monitors. 8. Professional office staff 7 days a week. We are the only music school in Georgetown that offers full time professional customer service for their students 7 days a week. Many music studio desks are staffed by the teacher/owner or more commonly an answering machine. We have 5 office team members who are available at the front desk during all teaching hours and live phone and email service every day to assist our clients quickly and professionally. 9. Free music recitals in a beautiful venue right here in Georgetown! Every parent just wants to know how their child is doing and if they are really progressing. One of the best ways for a parent to understand if their investment in lessons is really worth it, is to have their child participate in a recital. In April and December many of our students choose to perform in our biannual recitals. We hold these at a beautiful hall with all the equipment necessary to make you sound great. The recitals are held right here in Georgetown so you don’t have to travel for a world class recital experience. For our students these recitals are free and unlike many schools in Georgetown we do not charge for recital participation or admission fees. 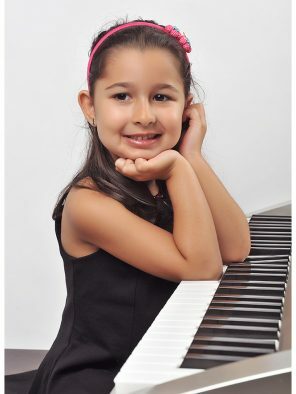 We are the only music school in Georgetown that offers a picture day for their students. Every May we host a free picture day with a professional photographer. This is a service that our student’s parents love as they all want quality photos of their children. Adults are welcome too! Students can bring their instruments to the photo shoot and wear whatever they like. We are conveniently located at 400 Guelph St, just up the hill coming from Norval. It’s very easy to get to from North and South Georgetown, Acton and Halton Hills. The Academy does not require full semester registration for lessons. Every student here is on a month-to-month basis. It’s easy to take the next step! Music lessons are first come, first serve so contact us today to arrange your first lesson!